A powerful Wall Street hedge-fund executive seeks to sell his trading company to bigwig banker James Mayfield. In order to get the best price, Robert Miller struggles to hide the precarious position his once healthy business empire now holds. He does so with questionable practices that threaten to destroy the lives of his investors as well as his family. That would’ve been enough story right there, but an unforeseen complication threatens to derail his comfortable family life even further. Arbitrage is director Nicholas Jarecki’s first feature and it’s a remarkably assured debut. It does play out a bit like a TV show, but the story boasts a stellar cast who raise the level of this drama above the ordinary. The supporting players shed light on a variety of dilemmas that confront Robert Miller. Actress Brit Marling is the admirable voice of reason as his daughter and CFO of her father’s company. Tim Roth, a detective investigating the death of a pretty young French artist, Susan Sarandon, his savvy wife. Her sensational speech in a climatic scene is a highlight. And let’s not forget little known actor Nate Parker who plays an important and unlikely contact of the business magnate. He’s memorable. However, first and foremost, this is star Richard Gere’s movie. 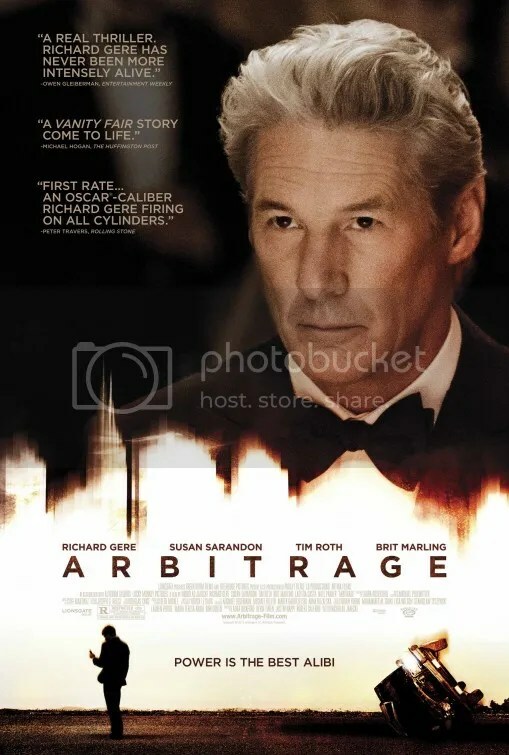 Arbitrage is an excellent showcase for Richard Gere‘s talents. As of late, the actor has demonstrated a knack for giving some great performances. Ever since Unfaithful, He appears to be gracefully entering the latter part of his acting career with some wonderfully nuanced work. Not since Cary Grant has a leading man entered his 60s so smoothly. Robert Miller is a man of incredible wealth and power. Richard conveys the desperation of a man on the precipice of monetary ruin. Based on his less than honorable financial dealings, we should completely hate him, but in his capable hands, Gere makes him a fully formed human being that does earn our sympathy along with the expected hatred. An economic thriller may sound like an oxymoron. It’s not an easy sell perhaps, but thanks to Richard Gere, he manages to make this character study of a flawed individual, compelling. This entry was posted on September 18, 2012 at 8:00 pm and is filed under Drama, Thriller with tags 2012. You can follow any responses to this entry through the RSS 2.0 feed. You can leave a response, or trackback from your own site. I really enjoyed it as well. Much more than I expected and I have actually been doubtful of Gere lately, but he steals every scene of the film and defines it. I wanted to see it again soon after leaving the theater. I’ve actually been very impressed with Gere over the last decade. He’s kind of re-defined the way I think about him. For further proof, check out The Hoax where he plays Clifford Irving, the investigative reporter who supposedly helped Howard Hughes write his autobiography. Hachi: A Dog’s Tale is a nice little movie as well. I actually brought up The Hoax in my review as well. Really enjoyed that movie and wish it would have garnered more attention. I haven’t seen Hachi yet, but have heard nothing but great things. Hachi is a bit manipulative, but if you’re an unabashed dog lover, bring Kleenex! nice review. Richard Gere’s performances are usually good. i saw this recently and its probably one of his best movies..along with Unfaithful, Officer and a gentleman, Primal fear… and there was another one set in China where he played a lawyer. Richard Gere really made this movie great. He is so believable and smooth. You know he’s rich when his wife tells him the check for a charity is only two million dollars. I laughed at that line. I also loved Susan Sarandons’ performance. I agree. Richard Gere is so good. A sympathetic villain is not easy to pull off. Interesting review, I’ve been out of the country and hadn’t even heard of this one but I might have to check it out. The last few movies I heard of Richard Gere being part of were duds (The Double, Brooklyn’s Finest) so it’s good to see him returning to form. I think I’ll have to pick 2 or 3 movies to see this weekend in theaters, but seeing as there are about 5 or 6 new releases that might be easier said than done. Anything you’re planning on catching over the next few days? I’m a pretty big fan of director Paul Thomas Anderson so I plan on seeing The Master first. In an hour in fact. Ha ha. I’ll probably also see Dredd 3D before the weekend is up. The Trouble with the Curve is the biggest new release. It probably will be the #1 film, but it just doesn’t appeal to me. Probably will wait for video. I might give End of Watch a chance later. Great review mark. This looks like my kind of movie, I am going to see this soon. I was wondering what stopped your rating from being at least a four. That seems to be the rating that would put it on your best of the year list. The story itself isn’t very original. It’s all about the performances. Richard Gere might deserve a nomination, but Best Picture isn’t warranted. Fantastic review, Mark. Really looking forward to this one, even if Jessica Chastain is not in it, as I initially thought, for some reason. Maybe you confused actress Brit Marling. She plays his daughter and CFO.